As you may have noted the inflation figures missed estimates to the low side with core CPI and PPI across the board coming up light. Inflation from this tight labor market and booming economy is so frightened of the technocrats at the Fed that it has apparently left town, just disappeared, moved to South America. The Street chose to declare that, like the end of history, we have also achieved the death of risk, and started piling back into equities, while selling gold, silver, the US Dollar, and the VIX. Apparently there was a bit of a dust up when JPM CEO Slippin' Jimmy Dimon said that he could best Trump in the next Presidential election. 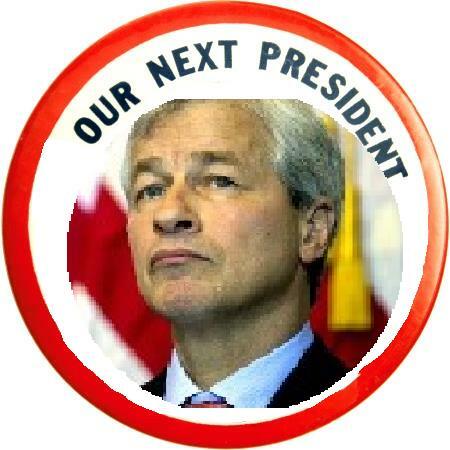 This afternoon the talking heads on financial TV were taken with thoughts of drafting Jamie Dimon for President. One analyst wondered out loud that after running JPM, no job would be worthy of him and his talents, except the presidency. (We are not worthy) And my jaw drops to the keyboard. "You are a den of vipers and thieves. I have determined to rout you out, and by the Eternal, (bringing his fist down on the table) I will rout you out." Where is Andrew Jackson when you need him?